Quilting Adventures: What a week .... ! I hope your husband feels better soon, it is hard not being able to do the things we love to do, with our hands. Your blocks are beautiful, I am working on a simple table topper with hand stitching, so nice and relaxing. How did you do in the storm? It is so nice to have our power back. Oh...ouch!!! I hope the end results from surgery will be positive. Love the hook and eye!! The blocks are very nice. I don't know how you are finding time to sew at all. 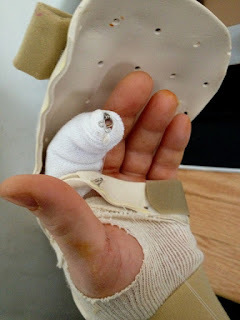 Oh, no - hope your hubby heals up soon - I'm sure he is not happy about this little setback! Love your quilt blocks! Oh No! Poor Hubby? Did he plan this ahead just to get out of shoveling snow LOL??? Pretty, pretty blocks! Poor YOU! I hope Stephen feels well soon and gains all the functions of his hand especially with all those beautiful wood creations he makes. A disabled husband is NOT fun! Please continue to breath and don't forget to make time for yourself. Hoppe your husband get's well soon! Just wanted to tell you how great all the blocks turned out. I can't wait to see it completed. Sorry to hear about DH surgery turning into the extended version with alternate endings. That hook & eye part of the splint is a very creative use of sewing notions. Years ago, I had to have surgery on all the tendons on my left hand reattached. When I got the OR I was shocked to see, amongst all the surgical instruments, a Black & Decker drill. It was too late to back out and that was my last conscious image (ugggghhh!). Tell you DH that when I came to I had regular shirt buttons sewn to the back side of each finger between the knuckle. Regular thread was used to sew the button through to hold the tendon in place. So, apparently sewing notions have a whole other home in oerating roomsnot just sewing rooms. I hope you do not suffer too much as the unhappy campers nurse. Poor Hubs - hope he is back to his usual self real soon. How is Stephen doing? Love the fabrics in your BOM quilt.